262 pages | 32 B/W Illus. The professional learning framework this book presents is designed to support teachers’ understandings of how language functions in their academic disciplines. This framework—a 4 x 4 metalinguistic toolkit—is informed by systemic functional linguistic theory and international educational research on academic and disciplinary literacies. The book shows and explains how teachers have applied specific 4 x 4 toolkits with students in middle school classrooms across a range of subjects for curriculum literacy instruction, assessment and feedback, resulting in substantial growth for their students in high-stakes national tests of literacy, as well as writing assessments in a number of subjects. In its focus on disciplinary literacies in diverse sociocultural settings, Academic Literacies in the Middle Years responds to contemporary international curricula for English language and literacy and the need for a strong evidence base for professional learning design. "This book provides essential content for teacher preparation to support students as they cope with texts in the various content areas. It provides the foundation to learn the language students need to function in school, especially under the current pressure to emphasize academic literacy. Without the emphasis on language, schools will not succeed in supporting students achieve in disciplinary literacies." 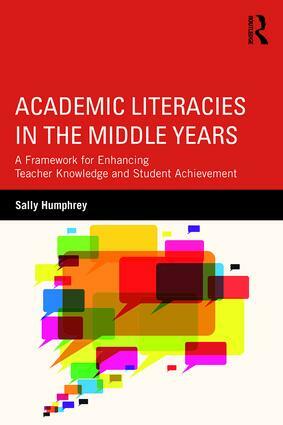 Sally Humphrey is Senior Lecturer, English and Literacies Education, Australian Catholic University, Australia.